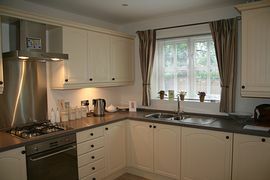 Five Star self catering in the heart of Stratford-upon-Avon. Yew Tree Cottage is one of two three bedroom holiday cottages superbly situated in a prime location across the river Avon from the Royal Shakespeare Theatre. 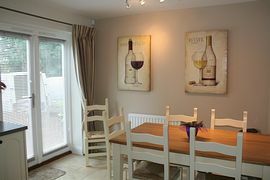 The cottage is of a high quality and tastefully decorated with accommodation for up to six people each with outside patio areas looking out over secluded gardens. Set in a delightful location next to the cricket ground the property is within 500m of the RSC Shakespeare Theatre and have direct pedestrian access to the centre of Stratford via the historic tramway. A five-minute walk takes you into the heart of the town and it's many fine restaurants, shopping and attractions. Tastefully decorated throughout to the highest standards the cottage provides all the comforts of home right within the doorstep of Shakespeare's home town. The property has been Awarded 5 STAR RATING By Visit Britain Tourist Board. 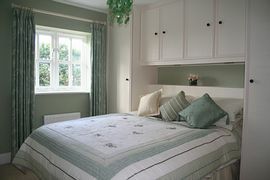 Also available is Walnut Cottage which sleeps 6 in 3 bedrooms. Ideal central location - 5 minutes walk from town centre. All bedlinen and towels provided. 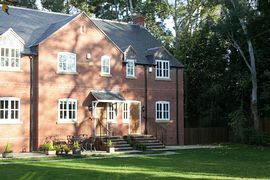 The rear south facing patio and private gardens are quiet and secluded providing great views across the cricket ground to the famous RSC theatre. The gardens have direct pedestrian access to the town centre which is only a 5 minute stroll away. Within 5 minutes walking distance of Stratford town centre. Easily accessible by road, rail and air and with secure off-road parking for up to 2 cars. With Birmingham International Airport around 45 minutes driving time away you have access to all budget airlines as well as scheduled carriers. For rail links Stratford-upon-Avon station is approx 15 minutes by foot. Road link access is easy with the M40 only 10 mins by car. Prices include central heating, gas, electricity, Wi-Fi broadband internet access, bed linen, towels, a welcome pack and a bottle of wine. 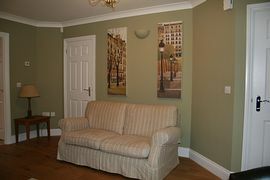 Prices for weekly bookings range from £450.00 to £900.00 per week. Weekly bookings from 3.00pm Saturday to 10.00am Saturday. From October 2009 the changeover day will change to a Friday. Short breaks will be considered in "off peak" season or at late notice. Minimum stay is two nights. Rates: two nights are 60% of the weekly rate, three nights are 75% and four nights 85%.